"My infant was only 12 weeks old when we started, and our instructor...always found ways to include the littlest of participants." ---Mary C.
All of the teachers at Music Together of Charm City are passionate about music -- and more importantly about supporting your child's musical journey. During their classes they create a fun, informal, musically rich social setting that supports the varied learning styles of both children and adults. All of our teachers have successfully completed the Music Toether teaching workshop developed by the Center of Music and Young Children, Princeton, New Jersey. Some teachers have participated in Music Together®'s Advanced Certification Program. 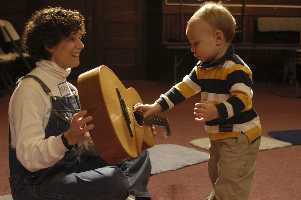 Director/Teacher of Music Together of Charm City, Miriam has been teaching early childhood music since 1998. She has a B.A. degree in music, a Master of Fine Arts degree in theatre, and she is a certified Music Together teacher. She has studied several instruments - including Renaissance and Baroque woodwinds - and has sung in both professional and college choirs. Miriam dances with swords (ouch, not real ones!) as a member of Charm City Rapper. Her daughter, who attended her mom's classes many years ago, recently graduated from college. Miriam sings REALLY loud in the shower (ask the neighbors)! Susan, who began teaching Music Together in January 2003, returns to Music Together of Charm City after a 2-year leave of absence. She has degrees in Theatre, History, and Social Work. A certified movement analyst, Susan taught movement to actors at the Baltimore School for the Arts for 23 years, improvisation and authentic movement for adults, and dance for folks with Parkinson's. She is well known as a dance leader/caller in traditional American and English folkdance, performs as a Hot Square Babe, and a Too Hot Mama. Susan has a daughter who recently graduated from college and a clarinet-wielding librarian husband. She sings REALLY loud in the car (maybe you recognize her from waiting at a stop light)!